The following recommendations for post-polypectomy endoscopic surveillance should be applied only after a high quality baseline colonoscopy with complete removal of all detected neoplastic lesions. 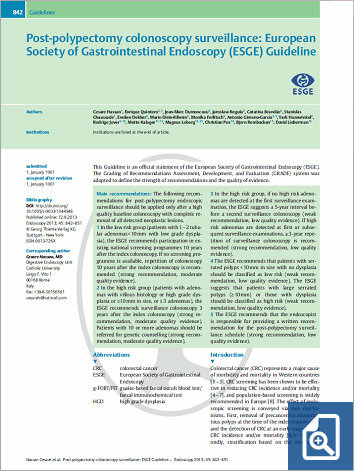 1 In the low risk group (patients with 1–2 tubular adenomas<10mm with low grade dysplasia), the ESGE recommends participation in existing national screening programmes 10 years after the index colonoscopy. If no screening programme is available, repetition of colonoscopy 10 years after the index colonoscopy is recommended (strong recommendation, moderate quality evidence). 2 In the high risk group (patients with adenomas with villous histology or high grade dysplasia or ≥10mm in size, or ≥3 adenomas), the ESGE recommends surveillance colonoscopy 3 years after the index colonoscopy (strong recommendation, moderate quality evidence). Patients with 10 or more adenomas should be referred for genetic counselling (strong recommendation, moderate quality evidence). 4 The ESGE recommends that patients with serrated polyps <10mm in size with no dysplasia should be classified as low risk (weak recommendation, low quality evidence). The ESGE suggests that patients with large serrated polyps (≥10mm) or those with dysplasia should be classified as high risk (weak recommendation, low quality evidence).